Kate and Chelsie: Wimbledon Cocktails The Fifth Floor Bar, Harvey Nichols London. Wimbledon Cocktails The Fifth Floor Bar, Harvey Nichols London. To celebrate the magical week of tennis that takes place each year at Wimbledon, The Fifth Floor bar have created a brand new cocktail list. 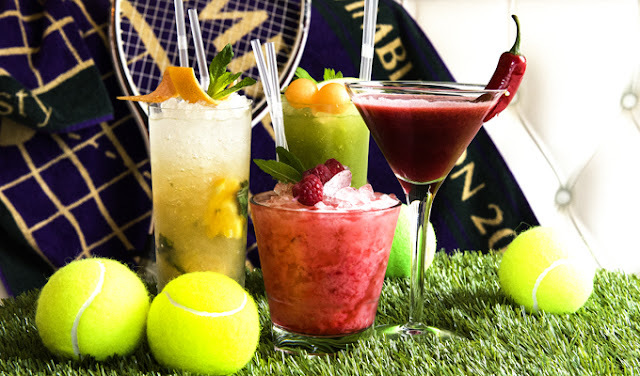 The specially designed Wimbledon themed cocktails feature players’ favourites such as Andy Murray’s Twisted Mojitoand Radwanska’s Chilly Raspberry Martini. Choose to enjoy our popular protein-charged Raspberry cocktail with a twist, The Wimbledon Cup or for a healthy non-alcoholic alternative, Match Point makes the most of the last of the prestigious grass tournaments showcasing a touch of green tea and celery. All cocktails are priced at £11.50 each, with Match Point at £7.50. Available throughout June at The Fifth Floor Bar, Harvey Nichols London.